Yeah I will be around for the next couple of hours so please post a picture. I don’t blame you. I wouldn’t let it go either. Thank’s Brother I will message you when I am ready to pick one up. Right now I have to save up for a SLR rifle works forend and 1-6x or 1-8x optic for a new AK I am getting. It has barrel with rifling and twist rate that hasn’t been used on a AK before. From the test I seen it is getting more velocity and accuracy from standard ammo. I want to make sure it is set up when I get it since my rifle will be used in a review or two. This is a titanium and micarta push dagger a good friend made for me. A mock up of a M9 survival knife Sam Wilson of Wilson custom knives is making for me. It will have a 9" long 1/4" thick CPM-3v blade with full height flat grind that transitions into a convexed edge. Yes the push dagger has micarta on both sides. You know I will show the Hollow handle bowie off when she is finished. I will probably hit the woods and spend a couple days testing my get home kit which tends to be more compact then most others. 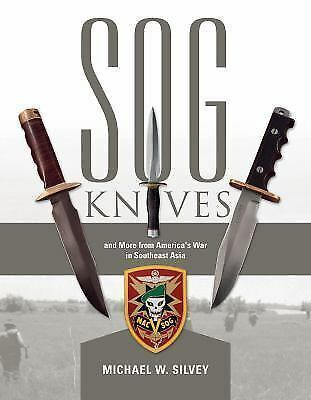 Excellent book: SOG Knives and More from America’s War in Southeast Asia, by Michael W. Silvey. Find great deals for SOG Knives and More from America's War in Southeast Asia by Michael W. Silvey (2016, Hardcover). Shop with confidence on eBay!